The web form can't send emails? Why don't I receive any emails even the form seems working? If you use Gmail, Yahoo or other email providers, all providers have email receive policies to filter spams.If the filters mark the email with high spam score, the email will be placed in spam folder. so if you don't see emails in your inbox, please also check emails in spam folder. Sometime, emails might be just silently rejected, and might be not put email in spam folder at all. This is the default mailer setting of JQuery Form. In most cases, the local mailer works just fine. Most web servers allow you to send out emails by your web forms. However, some hosting companies, like GoDaddy, they have web form sendmail restrictions. Your hosting company might require you to use a registered email as the web form email sender. After you have the registered email, please enter the registered email in "Settings > Choose Mailer > More Options". please contact tech support of your hosting company to find out what the restrictions are for sending out emails through web form. I highly recommend to use SMTP as JQuery Form's mailer. To increase email deliverability, you should use a SMTP server from popular free email providers, like Gmail, iCloud, Outlook.com, Yahoo, AOL, GMX, Mail.com, Yandex, and ZOHO. When you use a popular email provider as form email sender, the spam score of your emails will be much much lower, the ratio of successful delivery of your emails will be much much higher. Your emails might not be treated as spams at all. For example, you create a form, the form data receipent is you@Gmail.com, and you use an AOL email you@aol.com as the email sender. 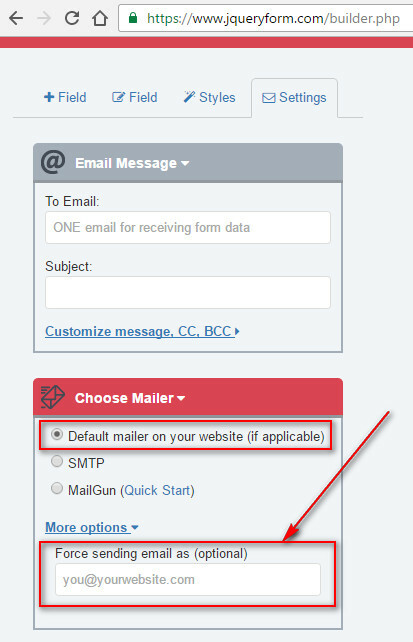 When a user fills out your web form and submit it, JQuery Form will send out email through a REAL AOL SMTP email server. It's the same process as you manually send out an email by yourself from your phone. Because JQuery Form sends out emails through a real AOL SMTP email server, when Gmail receives a email, it verifys and confirms that the received email REALLY is sent out by AOL, so the email is good and will be deliveried to you. To use SMTP, you can use an existing email account from those email providers. However, I would suggest you to sign up a NEW account from AOL, iCloud, or others, JUST use it as JQuery Form's smtp mailer. In this case, there is no interference with your existing email account at all. The form's recipent email adress can be different from SMTP email address. 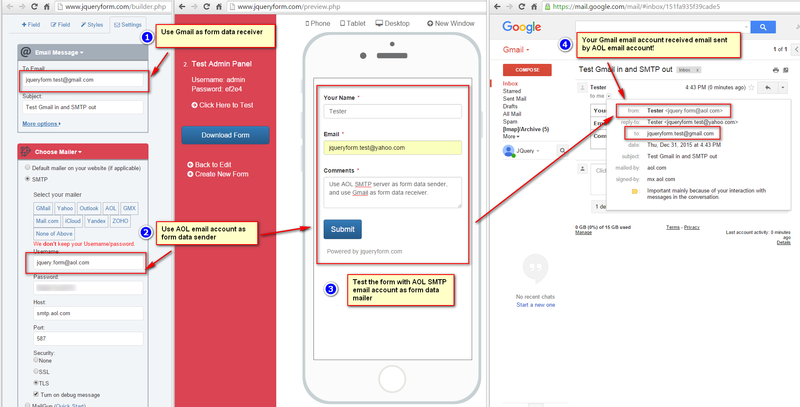 As below example, the form can send data to you@Gmail.com, but use you@aol.com account and send emails through AOL's SMTP server. 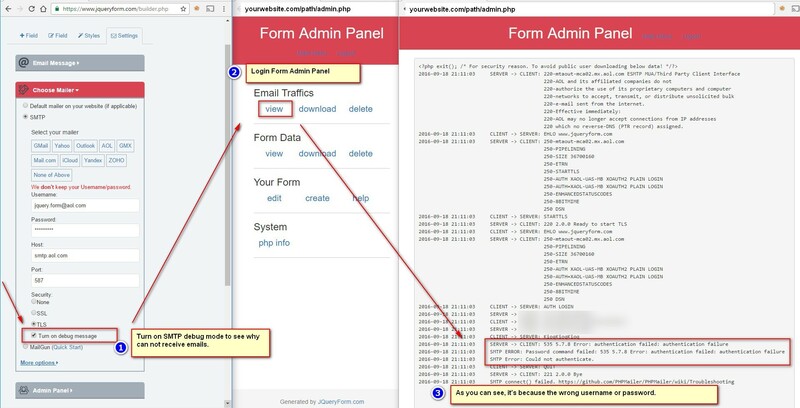 please turn on smtp DEBUG mode, test the form on your website, and login form admin panel to see smtp logs.